BALTIMORE (CNS) — Schools in the Archdiocese of Baltimore will see $86 million in investments over the next decade under a plan to strengthen the quality of education. The plan was announced by the archdiocese following an 18-month study on school needs. Overall, 19 of the 22 schools the archdiocese operates in Baltimore City and the immediate surrounding, including two that will be merged, will benefit from the expenditure. 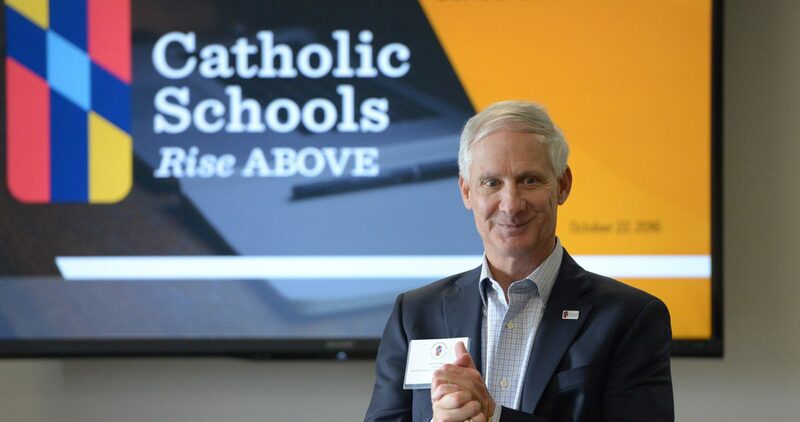 “We are committed to safeguarding the legacy of Catholic education in Baltimore and enhancing its quality in preparing for future generations of students,” he said, noting the average age of Baltimore-area Catholic schools is 61 years. The plan also includes, at the end of the 2016-2017 academic year, the closures of three schools: John Paul Regional Catholic School in Woodlawn, St. Thomas Aquinas Elementary School in Hampden and the Seton Keough High School in Baltimore. Seton Keough’s enrollment, currently at 186, has declined 66 percent during the last 10 years, according to the archdiocese. The high school has 47 seniors; in 2007 it had 123 graduates. John Paul Regional’s enrollment has fallen from 227 in 2006-2007 to 150 for 2016-2017, and St. Thomas Aquinas has dropped from 173 to 90 over the same period. St. Clement Mary Hofbauer School will merge with St. Michael the Archangel School, on the latter’s campus. With the exception of Seton Keough, the affected institutions serve students from pre-kindergarten to grade 8. Were they to remain open, the four campuses would require a combined total of $32 million for necessary facility condition and educational improvements, the archdiocese said. The study — by consulting firms Ayers Saint Gross, Datastory and Fielding Nair International — is the most recent push of a sustained effort to bring archdiocesan schools into the 21st century, said Barbara McGraw Edmondson, archdiocesan superintendent of schools. In 2009, the Blue Ribbon Committee on Catholic Schools first met at the behest of Cardinal Edwin F. O’Brien, then archbishop of Baltimore, and later produced a strategic plan. Sellinger noted improvements have been made since the Blue Ribbon study in marketing, advancement, technology, enrollment and management. Enrollment stabilized between the 2015-2016 and 2016-2017 school years at approximately 17,000 students across all archdiocesan schools. In addition to facilities, Sellinger identified increasing operational costs and changing demographics in Baltimore as current challenges. “If we’re going to be able to maintain highly enrolled schools that are accessible and that are desirable for students to attend in the future, we had to address these three challenges,” he said. In a letter to priests of the archdiocese Oct. 26, Archbishop William E. Lori said, “We know that this change will be difficult and we deeply regret any distress this creates for our families, employees, and community. We do envision an improved Catholic school system that better serves the needs of our students by making more effective use of the limited resources available to us. “Working together, we can continue to prepare our students for a future that is full of hope, promise, and fulfillment,” the archbishop said. The quantitative and qualitative study analyzed the 19 elementary schools and three high schools with regard to their Catholic identity; their students’ demographics and geographic locations relative to the schools; the condition of their buildings and infrastructure; and the schools’ abilities to support their educational mission. The final criterion assumed sound, safe, weatherproof facilities and went a step further, asking, “Is the design of the current facility effective in supporting the goals?” according to an overview of the vision and master plan provided by Sellinger and Edmondson. While closures are a part of the plan and vision, so are potential openings of new schools on the west and east sides of Baltimore as study areas showed areas of projected population growth where a Catholic school might serve a high concentration of Catholic families. Two new regional Catholic schools, serving students from preschool to grade 8, are proposed to accommodate some of that growing need. Sellinger noted, however, that no concrete locations had been identified because the no decision has been made to open new schools. The proposed facilities could cost approximately $31 million, in addition to the $86 million in investments identified in existing schools.